Offshore Europe and our ATEX certified flameless gas catalytic infrared heaters Flameless gas catalytic infrared heaters at the Surface World Exhibition,Birmingham N.E.C. The Surface World 2017 Exhibition in the N.E.C. in Birmingham opened its doors this morning. As industry experts in flameless infrared gas catalytic heaters and ovens, we have been asked by quite a few people why it is that we are not exhibiting there, especially considering that it is such an influential, well- attended and successful exhibition. In fact we have always had a good response from Surface World, which we have been attending regularly since the very first one in 1994 ! 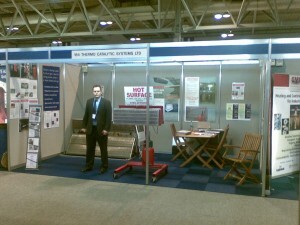 (Please see photo, above, of our stand at Surface World 2009). The answer is that the exhibition comes at a time when demand for our flameless gas catalytic infrared heaters is very high anyway. Finishing shop managers and paint sprayers are still thinking about a safe, insurance approved and economical means of heating their spray booths and drying rooms. So, this year we have decided instead to invest in stock and in keeping our prices as low as possible. We also have a number of ex-demonstration and reconditioned heaters that we can let go at unbeatable prices. So if you are looking for an ATEX certified heater that will reduce your drying times and still keep your insurance company happy please don’t hesitate to give us a call on 01782 511880.